Therefore we performed an experiment that included a two-stage flexible and versatile evaluation model by integrating data from SAP application and ML algorithms. In the first stage, we have applied data extraction algorithm on SAP application to build a data model comprising of relevant features. In the second stage, each instance in the data model is classified, on a rank of 1 to 6, based on the supplier performance measurements such as on-time, on quality and as promised quantity features. 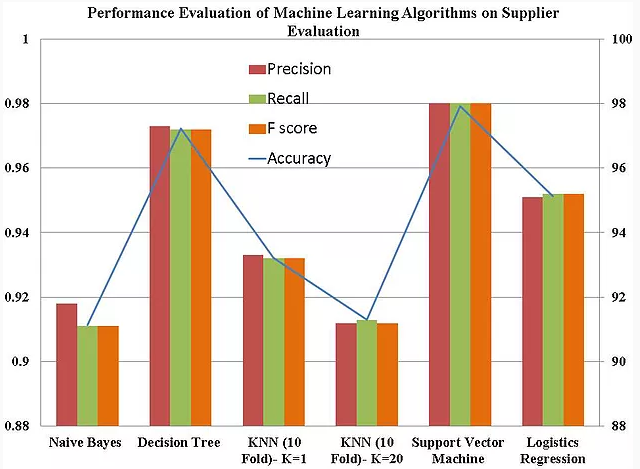 Thereafter, we have applied various machine learning algorithms on training sample with multi-classification objective to allow algorithm to learn supplier ranking classification. Encouraging test results were observed when learning algorithms,(DT) and Support Vector Machine (SVM), were tested with more than 98 percent accuracy on test data sets. The dataset prepared post completion of stage 1 and 2 was extracted from SAP IDES system. It consisted of 2303 instances for 140 suppliers including 17 features. This data was split 75 percent into the training set (n=1727) and 25 percent into test set (n=576) using WEKA resample filter with Invert selection and No replacement filter settings. The application of supplier evaluation model proposed in the paper can therefore be generalised to any other other information management system, not only limited to SAP, managing Procure to Pay process.